OR 18 had been in the Bitterroot for just over a week when biologists from the Montana Department of Fish, Wildlife and Parks (MtFWP) picked up a mortality signal from his GPS collar. He is the first collared wolf known to make the journey from Oregon to Montana. The two year old grey wolf from the Snake River Pack had dispersed from northeast Oregon, crossed the Snake River and managed to survive his cross country trip through Idaho, the state notorious for shooting Oregon wolves. OR-18 entered Montana’s Big Hole Valley sometime in May, headed north into Rock Creek and then into the North Sapphires. It was Saturday evening, between six and nine, on May 31, that OR-18 was illegally shot from a road between Sawmill and Ambrose saddles in upper Haacke Creek in the Burnt Fork area of the Bitterroot Valley, east of Stevensville. Marc Cooke of Wolves of the Rockies told me that the spot where OR-18 was shot is only (as the crow flies) five miles away from the Cooke’s house. He and his wife Lorenza were shocked to learn that the Oregon wolf had been poached so close to their home. They spoke with other Wolves of the Rockies advisors and the decision was made to raise a reward for the arrest of whoever shot OR 18. 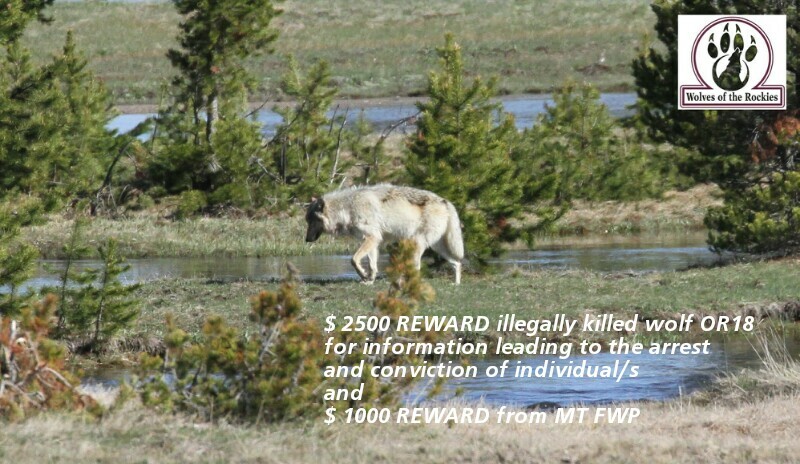 The money will accompany the $1,000 reward put up by Montana Fish and Wildife. Marc Cooke is hopeful as well. He believes that whoever shot OR-18 lives nearby. There is a good chance someone will know who did it and will see the reward ad that Wolves of the Rockies has run in the local paper. People talk, as does money. Perhaps we’ll never find out who shot OR-18. But the larger the amount offered the larger will be the statement that the indiscriminate killing of these animals will not be tolerated. There are so many worthy places to send your spare dollars, but right now I can’t think of a better place to donate. With the help of Wolves of the Rockies, Oregon Wild, and people like us, we can raise our unified voice to stop the poaching of wolves. To donate to the fund to catch the poacher of OR-18 contact Wolves of the Rockies via email, FB message or phone. This entry was posted in Idaho wolves, Montana Wolves, Uncategorized and tagged OR-18, Oregon Wild, poaching, Wolves of the Rockies. Bookmark the permalink. Thanks for writing about this wolf being poached in MT. It will show that the illegal killing of wolves will not be tolerate. Usually when an elk or moose is poached there is an outcry from hunters calling for the head of the offender, saying the poachers are not hunters. I wonder if any of those are equally outraged by an illegally killed wolf. I doubt it. Maybe the publicity and the size of the growing reward will facilitate getting information leading to the arrest of this arrogant, disrespectful coward. Somebody knows something about this. Step up and do the right thing. Thanks so much, Beckie. Keep up the great work! OR 18 is likely a victim of wolf hating yokel-hunter mentality and mythology that elk and deer need to be protected from wolves so man can kill them (sports killing AKA hunting). These people in general believe this mythology and resent that the wolf was imposed on them by the federal government. They do not see it as conservation, as balancing the ecology as it was for millennium before man the game manager for sports killing or rancher entitlement thinking as stewards of the land took over our politics. 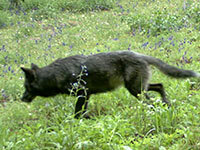 The wolf hating poachers are the SSS kind (shoot, shovel, shut up) and may even think of themselves as conservationists. Killing OR 18 is symptomatic of the hunter-trapper-rancher war on wildlife and the larger problem of balancing remnants of wilderness with the with the March of Civilization which opened up a war on wildlife now questioned and challenged by conservation efforts. I am hearing from several sources that the word is getting around rather fast about the reward. I understand from a very reliable source, an individual who recently traveled into the area where OR 18 was killed was asked by relatives if he happened to be the one that shot the wolf, of course he denied he was, but he elaborated further by saying that if he saw a wolf he would not hesitate to shoot it. Another person listening to the conversation reminded him of the reward offered and said “if you do shoot a wolf illegally, you realize that you will be tracked down and prosecuted”. So sad! Once again proves that human beings are the most destructive creatures on this planet.